In the 1990s, early versions of HTML mixed content and presentation in the same file. In 1997, HTML 4 was the first step in separating presentation from content. Today, separating content (HTML) from presentation (CSS) is the best way to build websites that will work on a variety of output devices. Text: the text (or copy) on your web page. To view an HTML document, a browser talks to the web server before before displaying it. HTML5 is the fifth revision of the HTML. Its core aims have been to improve the language to support for multimedia while keeping it easily readable by humans and consistently understood by computers and devices (web browsers, parsers, etc.). HTML5 is intended to subsume not only HTML 4, but XHTML 1 and DOM Level 2 HTML as well. Many features of HTML5 have been built with the consideration of being able to run on low-powered devices such as smartphones and tablets. The doctype tells the browser what standards to use to interpret the code. !DOCTYPE HTML PUBLIC "-//W3C//DTD HTML 4.01//EN"
The HTML tag tells the browser to expect HTML: this ASCII document is designed to be viewed in a web browser. There a variety of <meta> tags; one tells the browser which character set we will be using. H1 – H6 elements “briefly describe the topic of the section they introduce.” They form a semantic structure that can “be used by user agents, for example, to construct a table of contents for a document automatically.” An <h1> tag is our main headline and an <h2> tag is our sub headline. A <p> is the paragraph tag. The anchor tag, <a>, is how we build hyperlinks. If you think of an element like a noun (socks) then you can think of an attribute as an adjective (red). This example from Castro is perhaps the most important element-attribute pair in HTML: the anchor and HREF. When one element contains another one, we have a parent-child relationship. 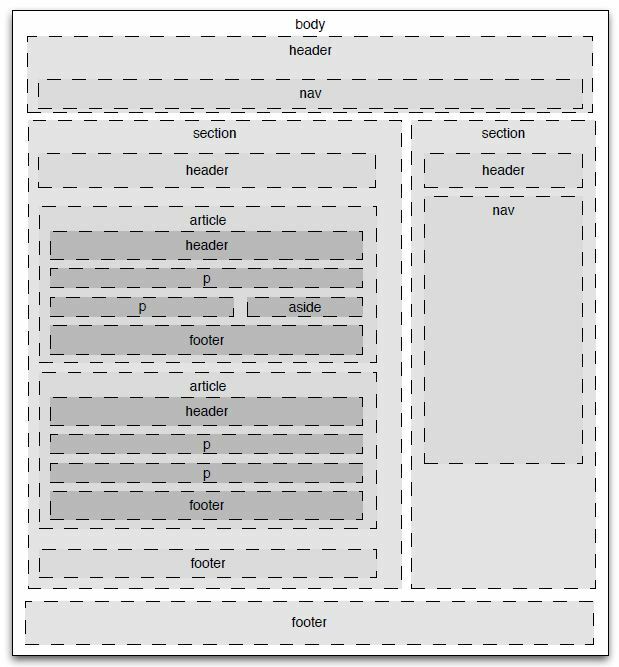 This family-tree-like structure is a key feature of HTML. When elements are nested, we need to be aware of the position of our closing tags so that the child is completely enclosed by the parent. There are two key types of elements: block and inline. Block elements force a line break (think the “return” key). Inline elements do not. The browser will collapse any spaces that we put in our code, unless surrounded by <pre></pre> tags. We force new lines using block elements like p, div, section, article, aside, header, footer, nav. Because we are using a limited character set (ASCII), we have to explicitly write special characters like & and < and >. Castro has information about these special characters. Using HTML5 semantic elements when you build your web pages means your sites will be more structurally consistent. The resulting pages will be more accessible to anyone who uses a screen reader as well as for search bots and other programs that need to interpret the content of a web page. Our code will be cleaner as we fight against divitis!